Property Size 1,564 sq. ft. This cozy, ground floor condo faces the pool and is just steps from the beach. 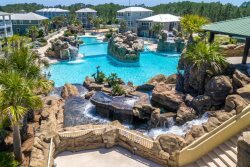 Just 2 blocks south of 30A, The Inn At Blue Mountain features a spacious open atrium, fitness center, covered parking, and outdoor grilling are all in a quiet beach setting. You will love the spacious, private covered patio that is furnished with rocking chairs, adirondack bar chairs, and a high top table for drinks or casual outside dining. All bedrooms have flat screen TVs and the master has blackout shades. The kitchen is fully stocked with everything you will need and has stainless appliances as well as a separate ice maker. The condo has a huge living area with separate dining table, bar area, leather sofa, Bahama chairs, 46" Flat Screen television, and a bonus card table overlooking pool deck. Add $160 for housekeeping and 11% for tax. There is a $69 damage fee, $30 Booking Fee, and 2.5% to process credit card payments. A 25% deposit secures the reservation for you and is applied toward teh total amount of the reservation.